Michelle Aguilar (right) won the Alumni Association Award in the Arts Division for her media presentation "El Cacao." 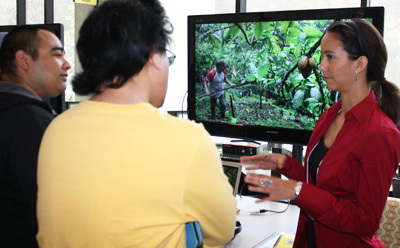 Graduate student researchers from across the divisions explained their work to a diverse audience during the 11th Annual Graduate Research Symposium at McHenry Library on Friday, April 24. The symposium included graduate student presentations in a variety of formats, including posters, 10-minute talks, films, and other media. An Awards Reception was held on the south lawn after the symposium. Two awards recognizing outstanding presentations in any discipline were awarded: a $250 cash Graduate Dean's award and a $500 cash award for the Chancellor's Graduate Research Prize. The deans of each academic division awarded a $100 gift certificate for the UCSC bookstore for the best presentation in the division. The UCSC Alumni Association also sponsored prizes, a $150 gift certificate for the UCSC bookstore, honoring presentations in each academic division. Chancellor’s Award: Robert Shelansky, Biomolecular Engineering & Bioinformatics, for the poster presentation "Dissecting the biochemical mechanisms generating intrinsic noise in gene expression"
Graduate Dean’s Award: Jessica Y. Neasbitt, History of Consciousness, for the poster presentation "Silver sutures, speculums, and lasers: What the birth of U.S. gynecology can teach us about the growing popularity of female genital cosmetic surgery"
Alumni Association Award: Michelle Aguilar, Social Documentation, for the media presentation "El Cacao"
Dean’s Award: Jenna Gerdsen, Theater Arts, for the oral presentation "Three Ramayanas on the west coast of the United States: Cross-cultural adaptation in American theatre"
Alumni Association Award: Damla Ozcelik, Electrical Engineering, for the oral presentation "Optofluidic biomolecular detection by spectral multiplexing"
Dean’s Award: Evan Paull, Biomolecular Engineering & Bioinformatics, for the poster presentation "Prototyping a personalized medical treatment strategy for patients with metastatic castration-resistant prostate cancer"
Alumni Association Award: Rita Jones, History, for the poster presentation "Power over sickness: Medical missionaries, metaphysics, and public health, 1870 - 1914"
Dean’s Award: Jessica Barbata Jackson, History, for the poster presentation "Problematizing citizenship: Italian immigrants in the Jim Crow Gulf South"
Alumni Association Award: Claire Masteller, Earth Sciences, for the oral presentation "Kelp, cobbles, and currents: Biologic reduction in coarse grain entrainment stress by kelp"
Dean’s Award: Angel Resendez, Chemistry & Biochemistry, for the poster presentation "Recognition of sugar biomarkers via a fluorescent probe based on boronic acid appended bipyridinium salts"
Alumni Association Award: Katherine Ennis, Environmental Studies, for the poster presentation "The birds, the beetles, and the bees: Creating a long term biodiversity monitoring program of the UCSC Farm"
Dean’s Award: Ann Drevno, Environmental Studies, for the poster presentation "Agricultural pesticide use: Policy implications of water quality management in California's central coast"